Its just eggless and butterless guys, not tasteless! This is a soft yet heavy cake which also happens to be quite healthy. I made it mildly sweet so my baby could enjoy it to her hearts content. You can always make it sweeter if you like. 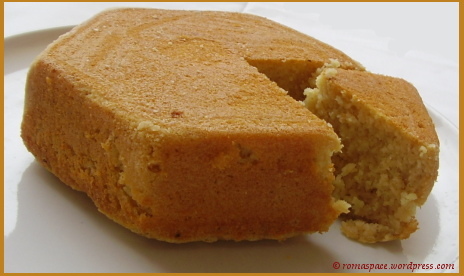 This cake is particularly nutritious thanks to wheat flour, curds and the goodness of milk cream. Malai or heavy milk cream is always available in every Indian home. Its like a sheet thats picked up from the surface of milk and can be stored in the freezer for long durations. Its usually later processed to make ghee or butter. However, the quantity of malai you get depends on the fat content of the milk. The milk I used when I was abroad never ever gave me cream 😦 I guess then you need to buy the cream separately (please be careful to not buy the fresh cream instead!). Eggless and butterless cakes are quite common these days but have you heard of a cake thats flourless? Yes, there happens to be a flourless cake called Sacher Torte which is a Viennese delight. It was created by accident and today is one of the most hit chocolate pastries world wide. I have a recipe of this in my book which I am yet to try out. For now, its the eggless, butterless cake. Blend all ingredients (except nuts) in a mixie jar. Dust finely chopped walnuts and almonds. Mix into batter. Grease and dust a cake mold. Pour batter into the mold. Bake at 180 Deg C for 45 mins. Since the ingredients used are very dense its essential to prick the center of the cake to check if its done. If the toothpick comes out clean then its ready else put it back into the oven for 10 mins. wow thats new. eggless and butterless. super. i have tried just 1 at a time i.e. either butterless or eggless. sure calls for a try. Wow really amazing without egg n butter, surely will give a try..
love the ingredients you have used…lovely cake..
Eggless-butterless cake sounds like a must try..and the cake looks so delicious..!! Wow, what a healthy cake. For once we can eat with out any guilt. Bookmarked. that shade of golden is lovely!! very healthy and butterless cake. amazing. bookmarked will try once for sure. And cake’s color is really very tempting :). i want to try this…can i use whipping cream or if not cream cheese in place of malai. i will be waiting for your reply.Please suggest. Dear All, Thanks so much. Yes, its one guilt-free cake! Whipping cream / fresh cream are both not advisable. You can use condensed milk or thickened milk in place of malai. If you use condensed milk reduce the sugar content accordingly. Hope it turns out well. Good luck! Looks neat! And I love the shape too. I have new found respect for Semolina, made a bread with it and posted today, and I am just amazed now at the cake recipe. Pretty versatile..
That’s definitely a good one Roma. Eliminating maida also completely. Good recipe. I have tried eggless or butterless but then oil was substituted in place of butter. this is wonderful, I will definitely give this a try very soon. Thanks, Poonam. Do let me know how it turned out. By wheat flour, do you mean wholewheat flour (atta)? I’m not clear. Yes, I mean atta/ whole wheat flour.